Rev. Norman E. Kerry, Sr. The Greater Mount Sinai Baptist Church was once a part of the Mount Moriah Primitive Baptist Church which was formerly located at the corner of North Alexander and East 11th Streets. In October of 1933, Mount Sinai Baptist Church was founded under the leadership of Rev. Thomas F. Fraylon. A trustee suggested the name be changed to The Greater Mount Sinai Baptist Church. That suggestion was agreed to by the congregation, and the name of the church remains today. During the elapsed time from its founding, seven pastors have served the flock: Rev. T.F. Fraylon, Rev. J.E. Fiddmont, Jr., Rev. W.F. Elliot, Rev. A. Walter Williams, Rev. Norman Kerry, Sr., Rev. Dr. George Cook, Jr., and Rev. Dr. Major A. Stewart. Under the leadership of Rev. Norman Kerry, Sr. and Rev. 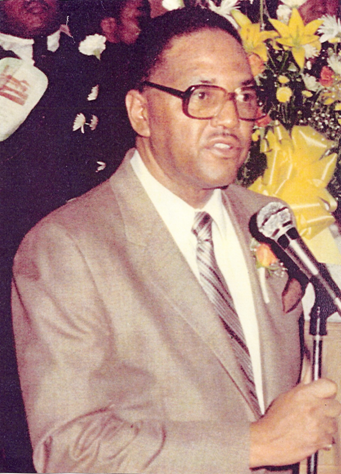 George Cook, Jr., numerous ministries and auxiliaries were birthed with the objective of activating the members into the mission of kingdom building. In 1996, a vision was revealed to Rev. George Cook, Jr. to lead the church into the “New Millennium”. The mission statement for the vision - “Being A Full Time Caring Church That Searches For The Lost” became part of the GMSBC church culture having been transformed from “Becoming A Full Time Caring Church That Searches For The Lost”. Greater Mount Sinai opened the Family Life Enrichment Center in 2010 in order to further expand the internal and external ministry reach of the church. Included in this complex are a Senior Citizens Activities Center, a Computer Training Lab, and Sunday School classroom space. Also included are a regulation–sized gymnasium which is used by our Youth Basketball League, the Christian Athletic Association, and the community. Other amenities of the center include conference rooms, classrooms, a walking track, exercise room, shower facilities, and other features which offer spiritual fellowship as well as educational and physical wellness opportunities within the church and community. Rev. Dr. Major A. Stewart, accepted the calling to become the 7th Pastor in the church’s history and he delivered his first sermon as Pastor-elect on November 6, 2016. Pastor Stewart was installed as Pastor on March 26, 2017. Pastor Stewart has been called to lead Greater Mount Sinai to a higher level of spiritual commitment and kingdom building through service to community and to each another. He has embraced the challenge to grow the fellowship in faith and numbers. While he is following Rev. Dr. George Cook, Jr.’s legacy, Pastor Stewart is in the midst of making his own indelible mark in the church’s history based on the vision that God has placed before him. Pastor Stewart stresses the importance of strengthening our foundation of Christian Ministry through Sunday School and Bible Study attendance, engaging ourselves in evangelistic outreach, practicing a consistent, balanced prayer life, immersing ourselves spiritually through Christian Education studies and reading the Word in addition to regular attendance and fellowship at Sunday Worship. The neighborhood where GMSBC is planted offers ample opportunity to take fuller advantage of the ministries and facilities as well as spiritual gifts that the GMSBC members have access to and possess. It is important for all to recognize the significance of why urban renewal in Charlotte in the 1970’s resulted in the church moving from 7th Street to its current location. It would appear that it is all part of God’s divine plan for the church to extend its reach into the world where it is needed. We, as followers of Christ should equip ourselves to meet that challenge to the best of our abilities. The slow, but steady sign of gentrification of neighborhoods surrounding GMSBC offer yet more options to extend our reach into areas of the community not otherwise considered years ago. We are uniquely positioned to reach out to those who do not know Christ as well as those who know Him, but are in search of a church home.